Under the anti BEPS measures proposed by the OECD and adopted by many of the world economies, including Romania, it is our great pleasure to announce the RSM Romania event “International Tax and Transfer Pricing in a BEPS context”, supported by AmCham Romania, BRCC and the Romanian Chamber of Tax Advisers, to take place in Bucharest at the Hilton Hotel, on May 11th. 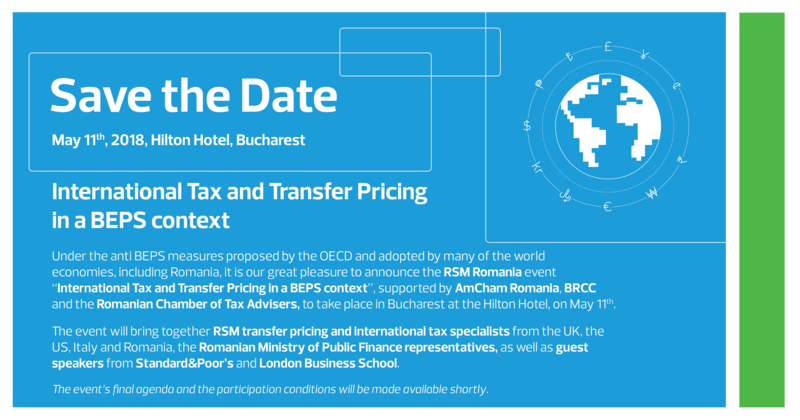 Th e event will bring together RSM transfer pricing and international tax specialists from the UK, the US, Italy and Romania, the Romanian Ministry of Public Finance representatives, as well as guest speakers from Standard&Poor’s and London Business School. *The event’s final agenda and participation conditions will be made available shortly.